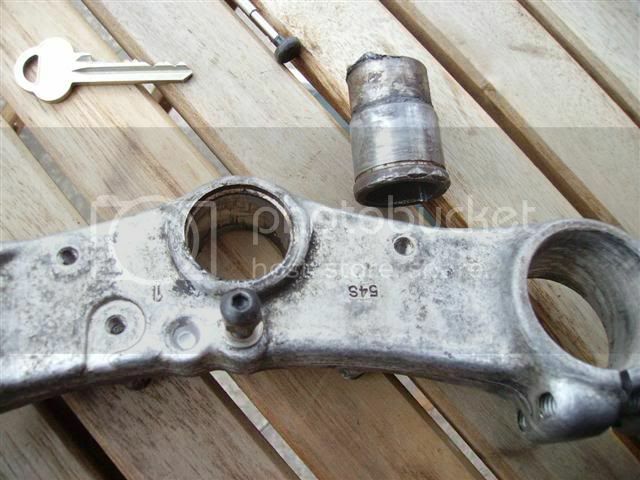 i would get a complete front end (wheel, yokes, brakes, mudguard,ect) as opossed to what i did and got bits and peices from every where, it ended up that i got the wrong calipers, the second set were to wide so needed some grinding. up to you really. 2. i pressed out the stem from the donor forks (gsx 750 in my case) but nearly every suzuki has a very similar width stem. 9, get your pre-prepared front end with bottom yoke loosly attached, and with your headlight bracket, clip on handle bars(if used) in place, and slide it in the same way you slid out the old one. 11. put you new top yoke (you will have to remove the old ignition swich, i used a grinder tio get it off the old yoke, and used 2 6mm screws and screwed it to the new one) on and put in the center bolt to hold everything in place. 12. tighten every thing in place, before you put your headlight back in check your steering stops.. i had to grind about 10mm from each side of the stop on the frame to get a decent steering circle. 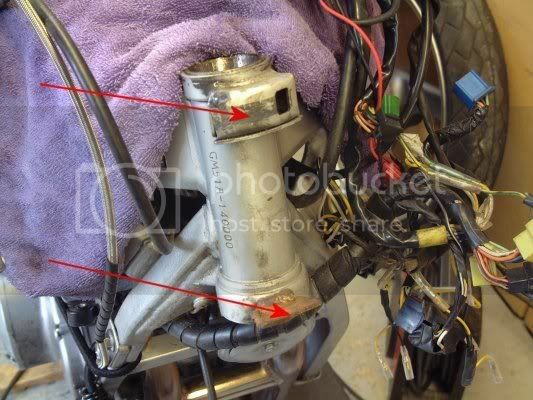 3. make sure you have all the brake lines a new master cylinder to hanle all the extra fluid that it will be pumping. also new pads are a good idea as well, may as well do it now while its easy. Great writeup. sticky material. you got any other mods planned? I see you did the GSXR tail and now the forks...looking good. I wish I could see that tail on a "F" model. You have very shiny shoes. lol, thats my neighbour. cheers. Why are my sheets WARM and sticky? Hang out there, we may flame, but we don't hate. My attitude is in serious need of readjustment, and I'm ok with that. you did it the hard way. most people would just get a gsxr front end and bearings. Nice job! Mind putting it on the wiki? '01 GS500. Sold. SM2s. Progressives (15W). Woodcraft Rearsets. K&N Lunchbox. Yoshi TRS slip-on. CRG bar-end mirrors. Pirelli Sport Demons. Billet Fork Brace. What did you do to the speedo , they look cool, did you just remove the cover? Great work mate!